Week 2. By Steve Trovato. Lick Library. Technique, Blues, Instruction. DVD. Lick Library #RDR0358. Published by Lick Library (HL.393177). 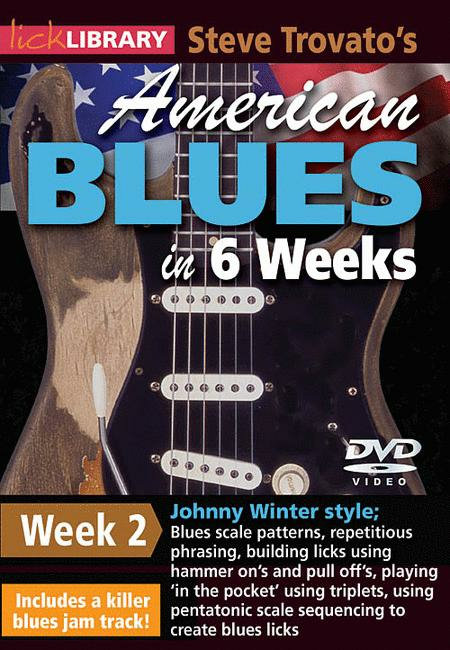 Welcome to the American Blues Guitar in 6 Weeks course. These lessons are designed to focus your practice towards realistic goals achievable in six weeks. Each week provides you with techniques, concepts and licks to help you play and understand blues soloing at a manageable easy to follow pace. Week two includes: Blues scale patterns • repetitious phrasing • building licks using hammer ons and pull offs • playing “in the pocket” • using triplets • using pentatonic scale sequencing to create blues licks. The DVD is presented by Steve Trovato who is best known as a world class country guitarist, but is equally proficient in a wide range of popular guitar styles. He has written a number of bestselling guitar instruction books, and maintains a full time position in the Guitar Department at the University of Southern California.